There are quite a few definitions of canon, the most appropriate may be Merriam-Webster’s “a sanctioned or accepted group or body of related works.” With regard to the franchise, canon means all of the works or components which are truthful to how things occured. Everything outside of canon are secondary, unofficial, side stories. Think of them as movies or documentaries which are 'based on a true story,' or fanfiction. Well, very official fanfiction. Within such a complex series of works, what's canon and not within Gundam can be confusing. At a high level, what counts as canon is any series or movie that's been animated or filmed by (or with association with) Sunrise. For example, the stories, characters, mecha, events, etc. within Mobile Suit Gundam (the original TV series) are all canon. The Gundam Unicorn novels, and all that happens within, are not canon. However, once it became a series of animated features, Gundam Unicorn entered into the realm of canon. When it comes to differences between the novels and the movies, changes in the movies now take precedence. Seems simple right? Well in a few areas it gets more complicated thanks to a handful of contradictory animated programs. The best example of this is Zeta Gundam. The original animated series, that’s canon. The Zeta Gundam movies, which features a significant change to the end of the story, are technically canon as well. In scenarios like this the traditional works more canon. A bit more on Zeta later in the article. In a 2001 roundtable discussion with Dengeki Hobby folks from Bandai discussed what counts as canon. During the discussion they put things into terms of white, gray, and black. White being official and animated works, black being completely not canon (the example they give is Char’s red Gundam), and gray - everything in between. They also indicate that nothing is really black or white, there’s quite a bit of gray out there in otherwise "white" works. Throughout all of my research into this topic a key point keeps coming up; the Japanese have a completely different concept of “canon” than we do in the West. In fact, it seems that they don’t even have a word that directly translates to canon. In the conversation previously discussed the participants use the word "オフィシャル" which directly translates to "official." What’s clear is that there’s not a lot of oversight, perhaps not a lot of interest, toward maintaining a strict canon. The various teams who have worked on the many installments have had quite a bit of leeway within the Gundam framework to create their own stories. Tomino is no different, though he has quite a lot more leeway considering his role. At the end of the day it’s not something worth fretting about. A lot of Japanese writers like to take concepts and ideas they previously developed and use them as the basis for other works even if connections between them don't fully make sense. Tomino, creator of Gundam, is a fantastic example of that. His stories have more influence from how he's feeling, happy or depressed, and what issues he thinks are important than what we might call respect for the continuity of his original story. Appreciate each story for what it is on its own. If you’re really interested, take time to understand how each work, or pieces within, do and do not tie into the framework surrounding it. So, now that we know everything is made up and the points don’t matter, what’s the point of a timeline? Canon or not, the franchise is full of related stories that flow in and out of each other. Some seek to provide additional details to the universe, others are adaptations and different takes that became part of the lexicon, and others just look to provide great stories and reference existing works without intending to influence them. The timeline I’ve put together is an attempt to illustrate the franchise and these many different stories. How they relate, how they don’t, and in one case, potentially all arrive at the same point. The way I’ve laid things out is certainly not official but I tried to do so in a way that’s as logical and accurate as possible. Perhaps it's best to think of it as a guide to how different installments relate to each other more than anything else. Before delving into the chart I’d like to take a few minutes to review Universal Century and the Alternate Universes for the uninitiated. A lot of folks tend to separate the Gundam franchise into two main categories, the multitude of series which take place in or around Universal Century (UC), and those completely separate which are generally lumped together as the Alternate Universes (AU). Universal Century came into existence with 1979’s Mobile Suit Gundam, the first Gundam work which would launch this vast franchise. Since its release a plethora of anime, manga, and game releases have added onto and built upon the original story. These many releases all take place within the Universal Century timeline and form up the majority of Gundam released content out there. If you're looking to get into Gundam, starting with Mobile Suit Gundam is always a good bet. Over the years authors have sought to take the Gundam mythos and add their own spin to it. These tend to end up being completely new universes with no relation to the original other than the key tropes of the series. This collection, while not nearly as verbose as UC, is considerably more diverse and unique. Works that fall into this this category include well known works such as Gundam Wing, Gundam SEED, and the latest, Iron-Blooded Orphans. Together, these separate series make up Gundam’s Alternate Universes. You'll probably want to click to enlarge. At this point I’m wondering just what you’re thinking. Mind blown by the complexity of the franchise? Confused? Angry because I messed something up? Well in the following sections I hope to at least assist with those latter two feelings and explain why I did what I did. At a few points throughout the history of the franchise they took a full length series and consolidated into a shorter collection of compilation movies. The Mobile Suit Gundam compilation trilogy (Mobile Suit Gundam, Mobile Suit Gundam: Soldiers of Sorrow, and Mobile Suit Gundam: Encounters in Space) and the Zeta Gundam New Translation trilogy (A New Translation, A New Translation II: Lovers, and A New Translation III: Love is the Pulse of the Stars) are the most notable. The trilogy based off the original series only makes a few minor changes, not enough to create confusion between the trilogy and the rest of the timeline and generally just happens to leave things out. Zeta’s New Translation trilogy takes things a lot further and completely reworks quite a few elements, the most important of which being the ending. Without getting into spoilers, the new ending pretty much precludes ZZ Gundam from existing as a follow up. For the purpose of my timeline I decided to separate these compilation movies out as adjoining timelines. The "Trilogy" timeline’s lack of changes result in a seamless integration back into UC proper. Whereas the "New Translation" timeline breaks out from UC and pretty much stops there. In theory it one could make an argument for it looping back in before or after Char’s Counterattack but there’s nothing (official or otherwise) to fill that gap. In many cases where an original manga has been adapted to an animated program, that manga has been left off the timeline in favor of the now canon animation. There have also been a lot of retellings of originally animated works through manga or novel formats. The original Mobile Suit Gundam in particular received multiple adaptations. As I haven’t read the majority of these I can’t preclude the possibility of changes, however minor, between the original and the adaptation. Because of this I broke them out into separate timelines. In the case of UC specifically the existence of multiple adaptations means that a particular adaptation of MSG may not line up with an adaptation or novel later in the timeline. It’s only for my sanity that I simplified them down into a single graphed timeline. Late UC, typically considered Gundam F90 and beyond, is generally considered a subsection of UC as it marks an era when the stories have little to no relation to the conflicts stemming from the One Year War. Which came first, the Reconguista or the ∀? Every time I shared an early version of the timeline for critique someone pointed out that G-Reco comes after Turn A. Why? Because of these comments Tomino gave last year. While partaking in a bit of a discussion a potentially inebriated Tomino said Turn A is, “around 500 years before” G-Reco. Much to the apparent shock of those in attendance apparently, and contradictory to earlier statements along the lines of how Tomino, "didn’t think about how G-Reco is connected to the other shows historically speaking." Tomino then goes on to say that he had apparently planned that from the the start. His provided reasoning isn’t that great though. “Was there anything of the Crescent Ship’s technology level in Turn A? It means they couldn’t have done it in Turn A’s era.” I didn’t really think the Crescent Ship was all that fancy, nor something impossible to develop between the changes required to go from Turn A's world structure to G-Reco's. Not to mention Turn A’s destructive technology could have easily resulted in the destruction of the Crescent Ship prior to G-Reco. Regardless, what Tomino said during the interview is a moot point. He may be the great and almighty Tomino, but he doesn’t decide what’s canon and what’s not, that’s up to Sunrise. I’m not sure whether Sunrise has said anything specific, but Sunrise’s G-Reco promotional material clearly claims that G-Reco takes place before Turn A. Thus, if you want to get technical about what’s official, then G-Reco takes place before Turn A. It’s worth noting that the above appears to be the one and only time this info has been put out there. Of course Sunrise could easily come out and say that was a mistake and Tomino is right. Again, it doesn’t really matter. Neither story features direct references to each other. At most you have some quick spatterings of references within G-Reco to Turn A. My placement of Turn A after G-Reco also stems from two other areas. The first being that I find more sound explanation in the arguments for Turn A taking place afterward. The second is that a key portion of Turn A’s story is built upon the concept of overcoming all the past conflicts, past conflicts from every Gundam universe. Throwing G-Reco after this resolution, with an unspecified age of even greater conflict in the middle, just doesn’t jive. Turn A Gundam’s place in the franchise is a very interesting thing. Hopefully you read through what I said earlier about the looseness of timelines and canon. Turn A is a perfect example of that looseness, and why you shouldn’t really think too much about it. Turn A technically takes place in the far future of Universal Century, however it’s a very soft connection. Aside from some equipment there’s no real direct connection back to the events of Universal Century. In fact, its history is made up of the events of all Gundam series (or at least the ones that had aired when Turn A came out). We shouldn’t really take this very literally. It’s meant to be taken thematically. All of the conflicts we’ve been exposed to within the franchise, they all cumulate into the conflict and resolution within Turn A. In the aforementioned interview he also said, “[Turn A] was to show that it’s a bunch of things lumped together, and to show that Turn A is a step away, time period wise and mental structure wise." It's best to think of Turn A Gundam as existing as a separate Alternate Universe series, one that is in ways a spiritual successor to rest of the franchise. Tomino has said that he didn’t take into consideration how the world of G-Reco ties into that of other Gundam series. 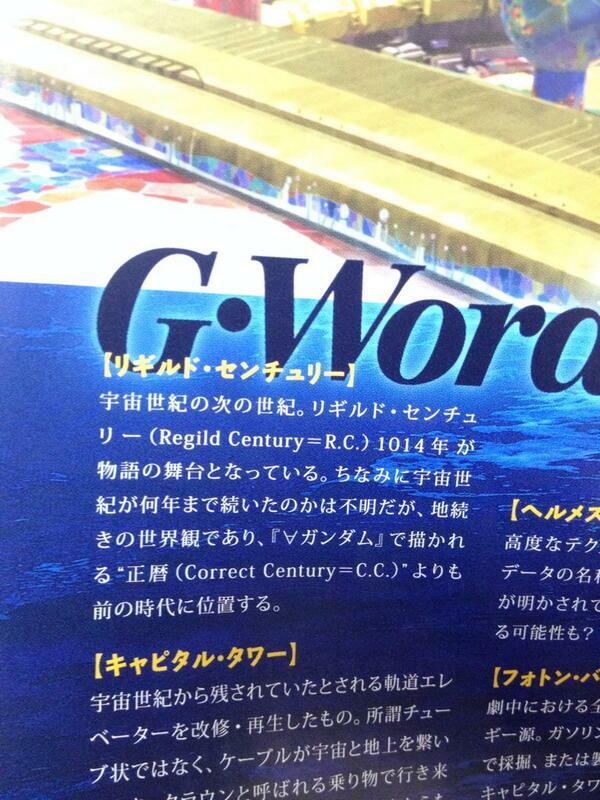 For all intents and purposes G-Reco, and Regild Century, exist in their own universe. 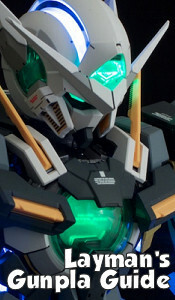 I have loosely connected to UC because of the UC suits that briefly appear in the series and the initial documentation stating that G-Reco predates Turn A Gundam (which has a closer connection to UC than G-Reco). Like Turn A, G-Reco is best considered a part of AU. It's easier to enjoy on its own than worry about connections to the rest of UC. Promotional shorts, such the Evolve series, were a special consideration. With Evolve, some installments sort of fit within existing works, others fit but with discrepancies, and others provide an altogether different alternative series of events. Other works, such as Ring of Gundam, supposedly take place within UC, but they lack any real indication of when, or real story for that matter. Because of this I’ve separated them from the rest of the timelines proper. They’re best thought of simply as the promotional shorts they are, short treats meant to highlight animation and design, not substantive entries to their prospective universes or series. G-Saviour, through the mandate that all which is filmed is canon, is canon. It’s an official part of Universal Century. That said, things get a bit more complicated (tired of this yet?). For many years now there has been mention that Sunrise cast it aside as “Alternate Universal Century” but I have yet to see any official documentation supporting that assertion. In preemption of the multitudes still arguing whether it’s canon or not, I through it in the “Zone of Canon Questionability” in a vain attempt to appease both sides of the argument. While canon questionability can also apply to many other non-animated works on the chart, I feel that G-Saviour’s unique place in the annals of the franchise call for this unique highlight. Look, just because something takes place in Anno Domini doesn’t mean it exists alongside everything else within AD as well. Placing something within AD is just a way for the author to tie that story to a basis in our current world. For those who are unaware, the ending the Gundam Unicorn movies is different than that laid out in the original novels. As such I’ve separated the novels out as a separate timeline instead of leaving it out (as a I did with most other novel/manga works later adapted). Gundam EXA, and its sequel EXA VS, are a pair fun manga series which features fun jumps into universes and meetings with folks from them. A whole bunch of crossovers. As far as I’m aware the events within EXA have zero impact on the universes which they visit. For the sake of completeness I tried to indicate EXA's connection back to everything else. I’m not sure what else I can speak to regarding the timelines at this point without breaking down and reviewing every little piece. I tried to be a thorough as possible in including as many works as I could identify and reasonably place. There are still quite a few that I’m unsure as to how they fit, so they’ll remain apart until more information becomes available. Of course, in any work of this scale where there exists a lot of room for accidental exclusions or mistakes. If you see any please comment below so I can include those in the next update of the timeline. I hope that this work has helped you better understand the franchise and, at the very least, provided a bit of visualization as to its great complexity. If you have any questions please don’t hesitate to ask.